The Fedora Design Team Bi-weekly Bounty is a bi-weekly blog post where we’ll outline a quick-and-easy design project that needs doing for the Fedora Community, outlining all the tools, files, and other resources you’ll need to complete the project. If you’re a designer and are interested in getting involved in the free and open source community, this is a good opportunity to get your feet wet! As you might have read about in Mel Chua’s blog post about Fedora 13 marketing deliverables last night, the Fedora marketing team is putting together a Fedora 13 press kit that will be provided to members of the press at the 2010 Red Hat Summit event in Boston, Massachusetts later this month. 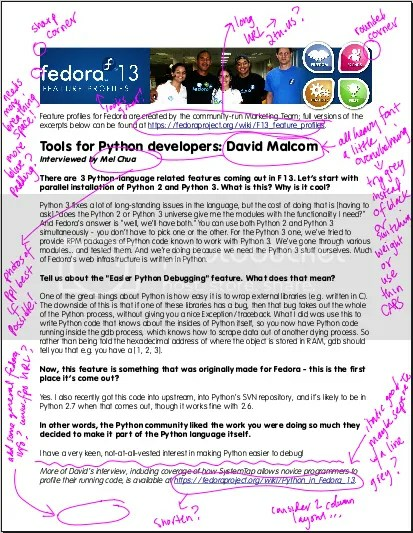 An important part of that press kit is the six-page Fedora 13 Feature Profiles document. The feature profiles are a series of excerpts of interviews Mel Chua, Paul Frields, Robyn Bergeron, Hannah Kowen, and Nelson Marques did with developers Stephen Gallagher, Dan Williams, Josef Bacik, Ben Skeggs, Tim Waugh, Richard Hughes, Mike McGrath, and David Malcolm to provide information and background about some of the new features in Fedora. Mel put together an initial draft of this document for print (OpenOffice ODT source) using OpenOffice.org. Your mission, should you choose to accept it, is to polish up the design and layout of the Fedora 13 Feature Profiles print document. Inkscape – You may install it on Fedora using ‘yum install inkscape’ or by searching for it in PackageKit. If you are not using Fedora, you can download it here. The MgOpen Modata fonts – the document uses the MgOpen Modata fonts. These are free & open source fonts. If you have Fedora you can install them by using ‘yum install mgopen-modata-fonts’ or by searching in PackageKit. If you don’t have Fedora you can download the fonts from their website. On Fedora, you install them by making a directory called “.fonts” in your home folder and moving the font files into that folder. For your personal portfolio you’ll have a layout that will be used as a part of a real press kit distributed at the 2010 Red Hat Summit professional event in Boston, Massachusetts at the end of this month. You’ll learn more about Fedora 13’s feature during the process of laying the document out – some of those features may prove interesting if not useful to you. 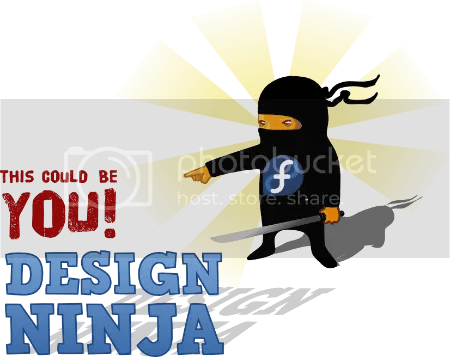 Bragging rights as a free/open source project design ninja & more importantly the first Fedora Design Team Bi-weekly Bounty designer! When you’re ready to submit your work, submit it on the press kit wiki page. If you need help email me (duffy at fedoraproject dot org) or pop into IRC! By the way, I’ve got experience with both GIMP and Inkscape (and of course OOo). If I was too late for this one, I’d love to try another one out someday! Thanks, I’ll start working on it tonight. Very probably pop into the IRC for some questions. I’ll let you know when I’ve got something! Thanks for taking this on, Jef! I’m one of the folks from the Marketing team who’s working on the press kit – and actually the original creator of the document that desperately needs layout improvement – so thank you for picking up on this, because that’s the limit of my amateur “I actually studied engineering” design skills 😉 – so if there’s anything I or the Marketing folks can do to help you out, just let us know. We hang out in #fedora-mktg, and I’m mchua on IRC. I accidentally started working on this before I realized you actually had to CLAIM the bounty. I’ve already made a smaller banner (as per Mo’s suggestions) for the headers after the first page. So if you’d like to see if that will help you claim the sweet bounty, let me know and I’d be happy to send it along. Anyways, good luck! Have fun! I actually haven’t started yet (long day, little sleep, etc). I’ll be at #fedora-art the whole day tomorrow, so that’s where you’ll find me. This looks like fun. I’m thinking this may be fun to do just for the heck of it (I like layout-stuff.. just not so much the content). I’m pretty certain Jef has already claimed the bounty, because he got some solid work done today and I saw a very-nearly-complete draft. However, if for some reason the bounty is still up for grabs, I’d like it.